As high-technology inventions become ever-more advanced, the options for fulfilling the biblical prophecy in the book of Revelation about a latter-day “mark of the beast” are getting steadily more discernible. Previous posts have examined this developing trend, and this post offers new information on the subject. The Prophet John had a vision in the late first century AD about end-time events that would occur on the earth just prior to the return of Jesus Christ. His prophecy in Revelation 9 is a good example of how John, who only had the very low-tech vocabulary of his time to describe the events of his vision, did a fairly good job of describing warplanes, attack helicopters and tanks in his vision of latter-day weaponry. John’s ability to describe what he was seeing in the “mark of the beast” was also limited by his very low-tech vocabulary. He had to use words that could give future readers at least a general idea of what he was witnessing in his latter-day vision. It is worth noting that when Jesus Christ gave John this vision (Revelation 1:1-2), he did not give John a high-tech vocabulary to describe what he saw. This “mark of the beast” is mentioned in chapters 13, 14, 15, 16, 19 and 20 of the book of Revelation so it will be a distinctive marker of the latter-day events discussed in this prophetic book. This post will focus on its mention in Revelation 13:16-17 as being some kind of identifying feature which will be present on either the forehead or hand of people living in this climactic, age-ending time. Recent posts have focused on the role of biometrics (facial recognition, retinal scans, finger-printing, etc.) which can be used as an individual “markers” to identify all people on earth in the latter days as a way to fulfill this prophecy. The first link offers us another updated set of possibilities for the fulfillment of this prophecy, which Revelation 13:16-17 reveals will be used as mechanisms for conducting financial transactions. Fulfillment of this prophecy could only occur in the very end of our age, and the fact that these markers are now present on earth affirms that we are living in the times when the prophesies of the book of Revelation are about to be fulfilled. The first link reveals that “wearable” smart technologies can be used on one’s hand instead of biometrics as personal financial identifiers. It states that technology exists to use “smart” watches, wristbands and even rings via which your personal financial and banking transactions can be conducted. Do you think this is the stuff of the future? It already exists and it was field-tested at the 2016 Rio de Janeiro Olympics. 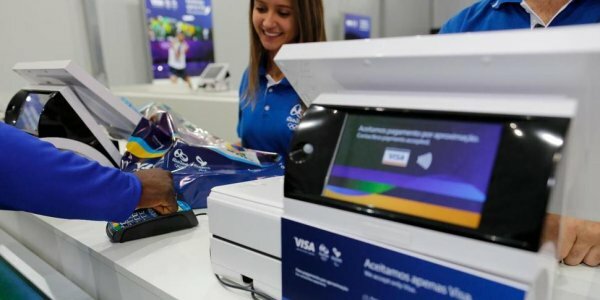 It adds that “By the end of this year, Visa expects merchants to have tap-to-pay capabilities at 50 percent of US locations where face-to-face transactions occur” (emphasis added). The article adds that “smart” technologies will enable people to implement financial transactions via their cars, appliances, etc. Transactions will also be conducted by use of biometrics such as one’s face, iris scans, fingerprints, etc. The technology to implement the “mark of the beast” system clearly already exists. All that is lacking is the beast power to come on the scene globally to implement such technologies. On a personal note, I found it troubling when I was asked at a restaurant recently to confirm a credit card payment via the use of my fingerprint rather than via a signature or drivers license ID. This was the first time I’d ever encountered such a technology, and I did call the manager of the restaurant to let him know I did not approve of the technology and that I’d be paying cash from now on when dining at his location. Media stories are pervasive about hackers getting into all kinds of personal financial information. If biometric information is also gathered into data bases, hackers will be able to steal all our personal identities more easily than ever before! The second link reports that Facebook has been aggressively seeking to obtain permission from its users to use facial recognition technologies on their accounts to not only identify its users but also all their friends as they appear on their accounts’ visual activities! Facebook, in my opinion, is becoming a kind of global spy network that harvests all the data that can be harvested about people. Its users are mostly blissfully ignorant of the personal information they are giving away and how their Facebook activities can be used to spy on many other people as well. All of this personal data-gathering will, of course, be used by the beast system when it comes into being. The third link describes an effort by the EU to rein in some of these mass data-gathering efforts by Facebook, Google, etc., but the effort sounds underwhelming to me. It seems limited to making the user agreements more understandable in “plain language,” but I saw no real limitations on their meta-data gathering activities. The article concludes with the observation that all social media platforms “assume” that all its users have opted-in to the meta-data gathering activities on each platform. Only when regulators forbid that assumptive status will any real changes be made in the massive spying on you and everyone else. I wouldn’t hold my breath waiting for that to happen. We are clearly heading toward a “cashless” society at some point in the future. Perhaps coins will still be used for the millions of coin-operated machines which dispense snacks, beverages, newspapers, etc. via coins or small currency bills. However, any financial transactions of meaningful or significant sizes are clearly heading toward electronically-monitored mechanisms. I do see a problem in the USA for the implementation of a truly cashless society. I urge American readers to look at a US currency bill and read the language on it that says in capital letters: “THIS NOTE IS LEGAL TENDER FOR ALL DEBTS PUBLIC AND PRIVATE.” Notice the word “all.” It would seem that the US Congress will have to change its currency laws before a truly cashless society can be implemented in the USA. Such an action would surely create a “battle royal” in US politics as the Republican party’s office-holders are quite dependent on the support of Evangelical Christians in order to win elections, and many Evangelicals and other categories of Christians are familiar with the prophecies of the book of Revelation and will oppose any such cashless society laws. To finesse this problem, the backers of the beast system may seek to gradually withdraw higher denomination bills from circulation as they are used, leaving only the low denomination bills in circulation for small transactions.